Sharing intelligence is a key part of every graph analysis workflow. Once your connected data has been explored, filtered, SNA’d, combo’d, and generally understood by an analyst, their next step is to share their new-found insight with colleagues. There’s already KeyLines functionality to facilitate that – serialise, export as PNG, etc – but how about integrating with the tools your analysts already use? The beauty of KeyLines as a library is that integrating with other technologies is usually simple. In this blog, we’ll see how KeyLines can plug into the Jupyter Notebook. It’s an app that gives analysts a single place to clean, model, analyse and visualize their data. You can embed other tools and technologies, and multiple analysts can work together on a single notebook. We’ve found it’s especially popular with data scientists in domains like intelligence and cyber security where collaboration and insight sharing is critical. Why integrate KeyLines and Jupyter? In this article, I’m using Jupyter Notebook version 4.3.0. We haven’t tested it with other versions, and can’t guarantee these steps will work for all future versions. That said, if you do have any problems our excellent support team is on hand to help. The first thing to do is download your KeyLines files from the SDK site (request a trial account here if you don’t already have one). Next, create a new directory for the notebook. In this directory, place the ‘assets’ folder that comes with KeyLines. It contains the images needed for your chart navigation controls. Then, make the keylines.js file accessible to your notebook. The easiest way to do this is to move it to your nbextensions folder, which is created by default when you install Jupyter Notebook. On my Mac machine, this global directory can be found at: ~/.ipython/nbextensions. Now create a notebook in the same directory as the assets folder, and load it to see your blank starting point. We could change the width/height of our chart, but this default is fine. Now let’s use require.js to get the KeyLines library we previously installed in the nbextensions directory. Within the callback of require, we now have complete access to the KeyLines API. 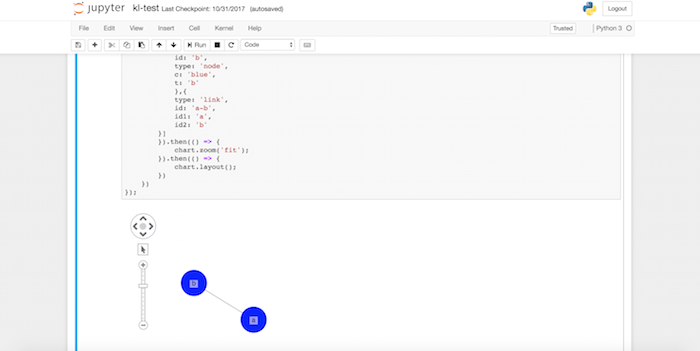 Are you inspired to enrich Jupyter with graph visualization? You can find more about Jupyter on their website, and request a KeyLines trial over here. Let us know how you get on! Jupyter, Jupyter Notebook and Project Jupyter © of Project Jupyter.